Submitted by Teal Sound: Teal Sound held its first full rehearsal camp of the year last weekend in Jacksonville, Fla. "I think everyone is blown away by the turnout of students, the horn sound this early in the season, the groove the percussion section has found and the high level of intensity and quality the color guard is showing. The corps should be well over the 100 member mark this year and very close to a full-size corps," said Teal Sound corps director Randy Blackburn. At that camp, the corps announced its drum majors for the 2007 season. 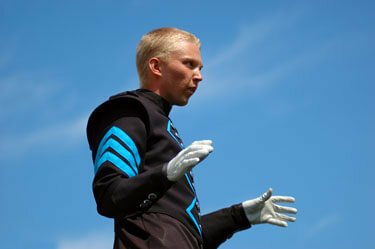 Bobby Duncan, who will be returning for his second year as Teal Sound drum major, is a senior at Lee County High School in Albany, Ga.
Bobby Duncan will return as one of Teal Sound's drum majors in 2007.